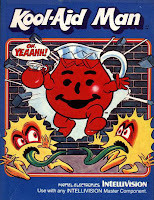 Gen Xtinct: Funky Food Friday: Kool-Aid Man--Ohhhh yeah! I admit, I was never a gigantic fan of Kool-Aid. Whoever made it either dumped too much sugar in it, and it was sicky sweet, or they held back, and it wasn't sweet enough -- just like red water. But I was an enormous fan of the Kool-Aid Man, who smashed through walls to ensure kids didn't die of thirst, and never had to go back and make repairs for his damage. This ad below is the one I remember the best, with one of the painters smashing his wet brush over his fellow painter's eyeglasses as Kool-Aid Man charges past, breaking down their freshly painted fence. Also, did kids really get that sweaty and hot skateboarding? Not the way these kids do it. But apparently they came prepared -- with glasses full of ice, just in case an anthromorphic pitcher of a cold beverage comes running by. Note how the song kind of changes into a 1950s doo-wop tune for a while. But funniest of all is how it doesn't appear they thought out the Kool-Aid Man's costume very well. He kind of has elephant legs, and it doesn't look like they cut any eyeholes, as he teeters down the hill at a slant and almost falls over. I also get a kick out of this "Family Guy" sketch featuring Kool-Aid Man. OH YEAH! And apparently Kool-Aid Man was an Intellivision game. GET OUT! Haha awesome! I loved Kool-Aid as a kid. Kool-Aid has so many discontinued flavors and discarded mascots and no longer made products you could mine it for years. I too love that Dane Cook piece on Kool-Aid Man. How funny you put this up today as I myself just looked back at the Kool-Aid Wacky Warehouse and some of the insane mail order crap they peddled to kids in the '80s and '90s.